A new deck railing can add interest and beauty to your home, while increasing the safety of your deck. If your deck needs a new railing, you can build a simple style wooden railing within one weekend. Keep the material of your deck and its overarching style in mind when choosing your railing. A simple wooden railing works well for many decks, but would be out of place on a composite deck; always build to suit what's already there. This simple style of deck railing is generally made from poplar or pine, and if maintained and stained properly can last up to 10 years once completed. 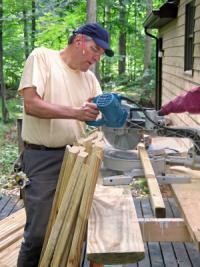 Cut the 4 by 4-inch boards into posts using the chop saw. Cut the top of the boards straight across and the bottom at a 45-degree angle. Drill two, 1/4-inch pilot holes in the posts. Make the first hole 1-1/2-inches above the 45-degree cut and the second hole 2-inches above the first. Counter drill each of the pilot holes to 1/2-inch depth using the 1-inch spade bit. Mark the position of each post on the corners of the deck railing. 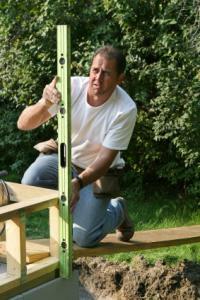 Position the post so the bottom of the 45-degree cut is flush with the bottom of the lower, outside edge of the deck. Use the level to ensure each is square and plumb. Take down the post and pre-drill the deck with a 1/4-inch bit. Attach the posts to the deck using 3/8 by 4-inch lag screws and washer. 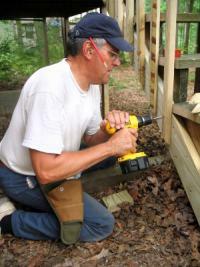 Nail a 6 by 2-inch board vertically on the inside of the posts, running the perimeter of the deck. Attach the baluster posts to the outside of the deck and the 6 by 2-inch rail every 3 to 4-inches around the perimeter of the deck. Level each board so its 45-degree cut is flush with the bottom, outside edge of the deck and the top is level with the top of the 6 by 2-inch rail. Drive screws through the balusters into the edge of the deck and the 6 by 4-inch rail. Lay 2 by 4-inch boards across the tops of the balusters and the front, inside rail, screwing it down in the front to the front rail. Attach a corner post to the outside edges of the top and bottom of the stairway. Temporarily attach a front, 6 by 2-inch board at a diagonal that matches the pitch of the stairs between the two posts. Mark the edges of the rail where it needs to be cut to lay flush with the posts. Cut the rail and attach it to the posts. Level and secure the balusters and top railing in the same manner as the rest of the deck rail. Stain the new rail to match the rest of the decking. With a new railing, your deck is more secure and visually appealing. Be sure to measure and level at each step to ensure your balusters line up perfectly and square evenly with the posts. Take the time to build a new deck railing and enjoy everything your deck has to offer this summer.